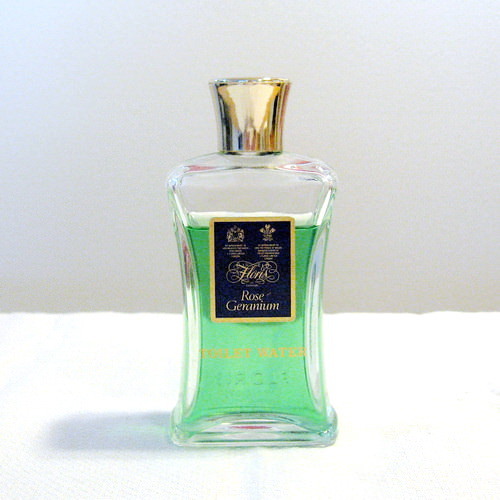 Ive read some post here regarding Floris Rose Geranium cologne and I just saw a new listing for it on Ebay - I would have purchased it myself but the seller is unwilling to ship overseas. Funny coincidence - I just got some rose geranium powder to use as a tick repellent, and I was thinking that it would make a nice shaving scent. One of the myths of our world - probably with a basis in truth - is that Floris once made a Rose Geranium shaving soap. They certainly, maybe still do, make a bath soap in the scent. I have a couple of cakes left in the box of three I bought many years ago. It's lovely, and reputed to have been WSC's favourite bath soap. Well, I bought the toilet water. I'm going to use it to add fragrance to the lather of a few of my really old tallow soaps that have lost their scents. I'll try to report on it. Congratulations! Better that somebody here bought it, then at least I can get a report! The vintage Floris Rose Geranium toilet water arrived. Its fragrance is wonderful, with the earthy greenness of the geranium balancing the sweet rose. In fact, it smells so good that I am going to try it at pulse points - although my skin usually does not tolerate toilet waters or colognes - rather than just for adding fragrance to old shaving soaps.